Last model in Apple, in stock now at Bloom Maternity. Called the “Louboutin” of strollers by Moxie Photography, mother of twins. Wow Nikki! 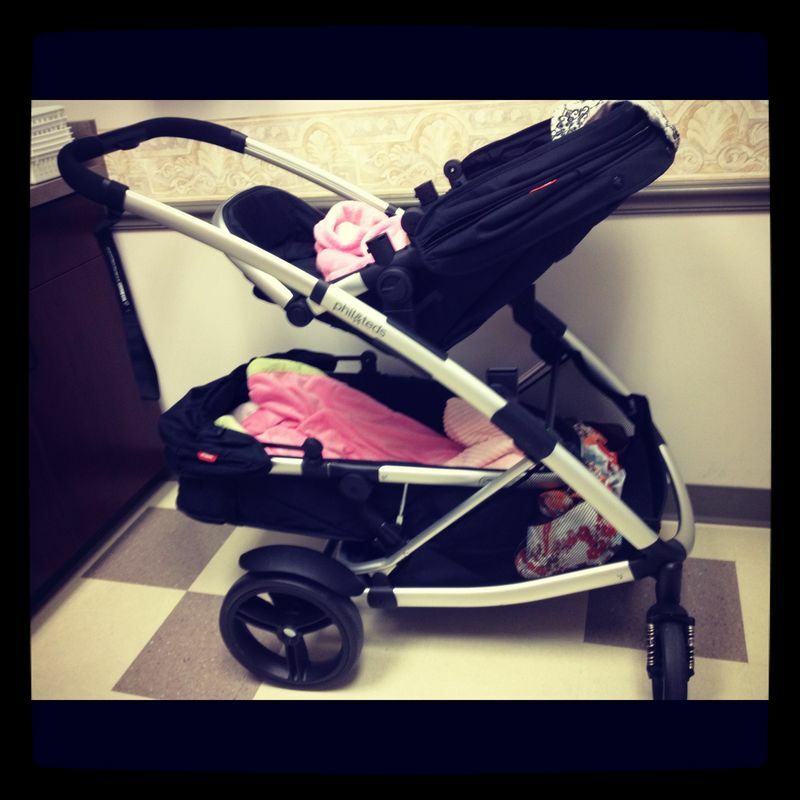 Thanks so much for this great review for the phil&ted Promenade Stroller. Nikki is a mother a five, with the youngest two being infant twins. Besides having her plate full with being an awesome Mom, she’s also a kickin’ professional corporate / infant / family / senior-year photographer that is very popular in San Antonio, TX. 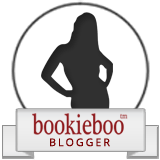 Check out Nikki’s blog over at Moxie Photography to get a peek into the busy life of a professional photographer, mother of five with infant twins mixed in. All I can say is that her life is not boring. If you happen to know me personally, you know that exercise and I aren’t best friends. I would like to be good friends with an exercise routine, but I’ve never hit that adrenline high to where I crave to get my heart beating and sweat dripping. So it came as a surprise to my husband when I joined Stroller Strides of San Antonio. I had been using the excuse of not having the time to exercise because of the baby. Or the timing of classes never worked with my schedule. However I knew about Stroller Strides and casually glanced at their mailings that I had signed up for via email. Then a couple of weeks ago I received a promotion offer — the first five people to respond would have their registration fee waived. I’m a sucker for contests so I immediately responded. Thirty-seconds later the phone rang and before I knew it I was signed up for the next day’s Stroller Strides class. What had I gotten my lazy muscles into? 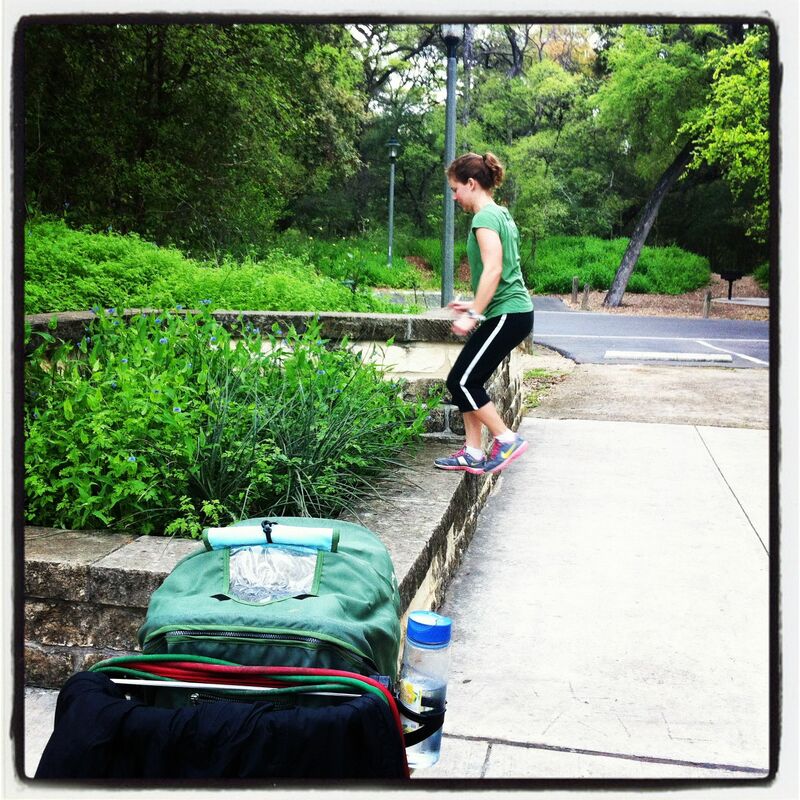 The group I belong to is new, and it fits my morning schedule and area of town perfectly — we meet at Brackenridge Park next to the zoo. I arrived slightly late (due to a diaper change) and met my instructor Amanda and another participant Christina. After brief introductions we started into our warm ups: jumping up and down, twisting side-to-side, working up a quick sweat in this humid Texas weather. Then off we power walked through the park. Amanda, my instructor, alternates power walking with intervals of strength and body toning exercises using exercise tubing, benches and/or walls, and then a little bit of yoga at the end. Usually each routine offers a low impact option for the physically out of shape, like myself. But then I’ve discovered that the low impact versions are also good if you have a full bladder. For each class you’ll need a stroller (baby optional), water, snack for baby, a small towel (you will get sweaty), and mat. Thus far I’ve survived three classes, and am gingerly walking through my house because I’ve terrorized muscle groups that have laid dormant for years. I know this is a good thing. Another good thing? This unique program provides moms with the opportunity to meet other moms and engage in playgroups with their babies. Yesterday, all the classes around the city combined at North Star Mall due to the weather and I observed strong bonds amongst the mothers. They were all good friends. 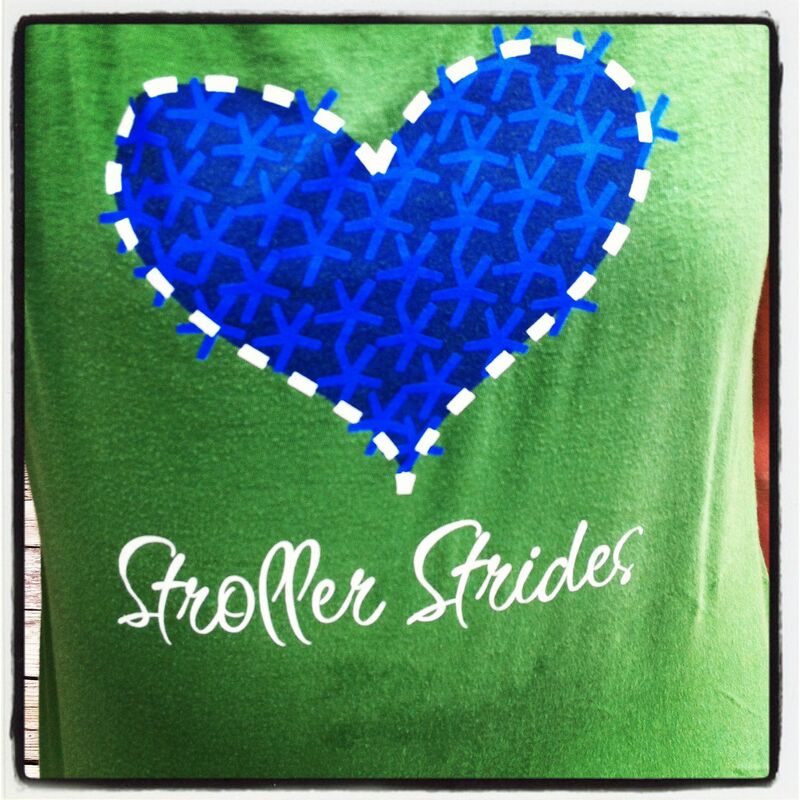 Even if you don’t live in San Antonio, there is likely a Stroller Strides class in your area. Stroller Strides claims to have 1,200 locations in 44 states. 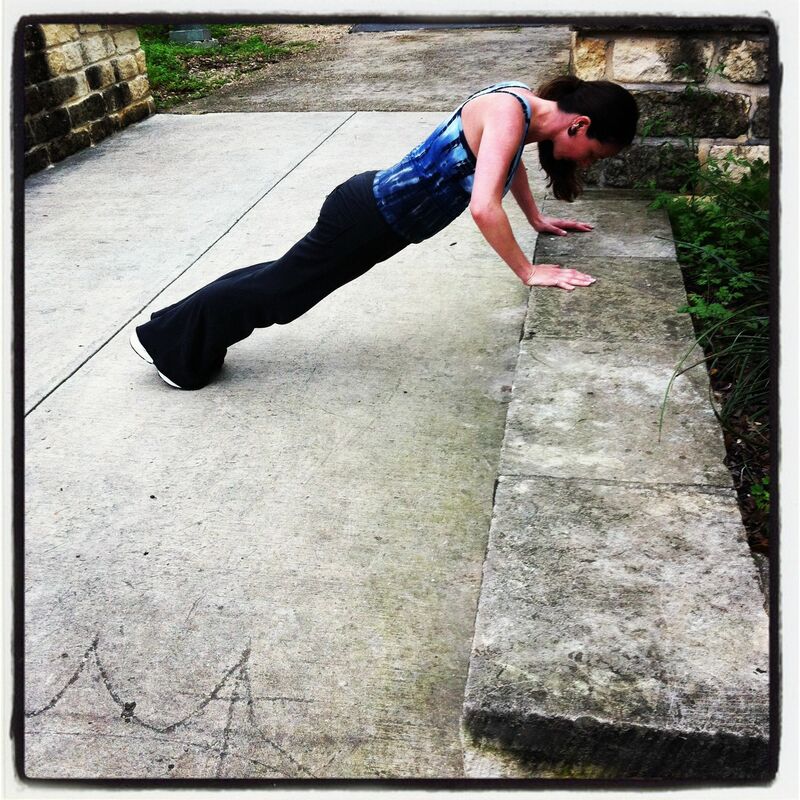 All classes are taught by certified and specially trained fitness instructors. 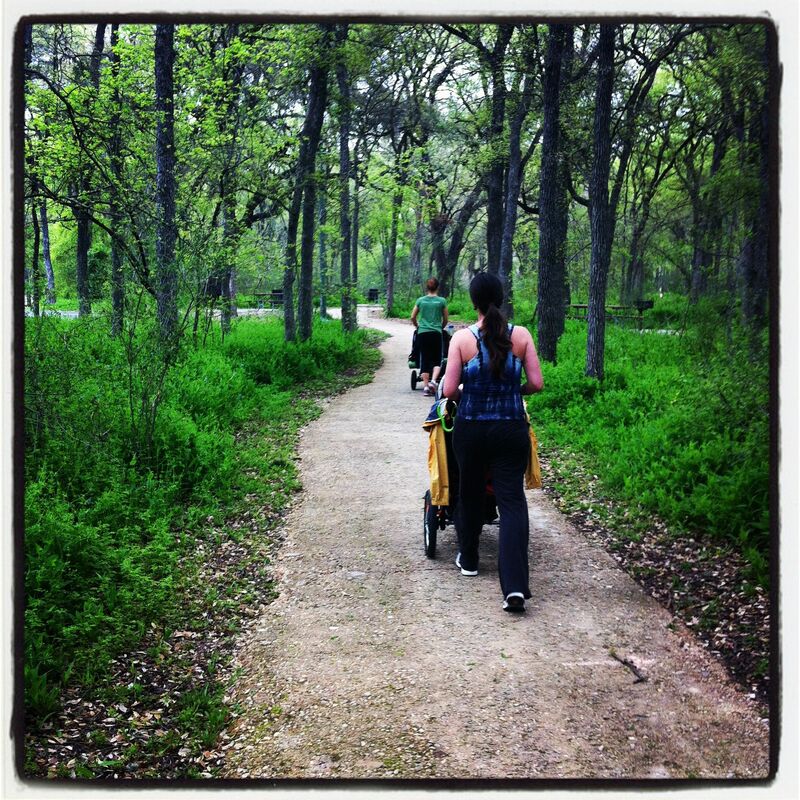 Stroller Strides is truly wonderful for any level of exerciser, take if from me. My only regret is not joining sooner, right after my baby was born. This would have made transitioning from a professional to a stay at home mom so much easier. If you live in San Antonio and would like to see what Stroller Strides is all about, please join me for the Brackenridge Park Grand Opening on Wednesday, March 28, 9:30 a.m.
To Celebrate their Grand Opening, they will have a fun free class with goodie bags, raffle items, treats for the kids including cookies from Lily’s Cookies and a Special 15 Minute Mat Exercise Led By Studio A:Pilates. The Bloom Blog was not compensated for this review of Stroller Strides. Is Your Stroller over 20 lbs? We’re in the midst of the nation’s busiest travel season, and for those of you who haven’t traveled with a baby in recent months, might be surprised to find out that at least one airline won’t let you take your favorite jogging stroller behind the security gate. Traveling alone with a 3 year-old and a non-walking 12 month-old, I was stunned. However the ticket agent had mercy on me and allowed me to take the stroller through to my destination since this was such a new policy. On the return flight, a few tears helped me get the stroller past security again, however I noticed my stroller was conveniently baggage checked (& unaccessible) when I stopped in Dallas for my lay over. Actually American Airlines told me the new stroller restriction was a FAA policy, which I believed until I traveled again a couple of months later. Flying with a different air carrier, I called to verify the stroller restrictions and the airline laughed at AA’s policy. They said that was like restricting wheelchairs behind the security gate for travelers. We’ll see if other airline carriers take note and institute the same inconvenience for mothers. This is the last week for our phil&teds explorer stroller sale. For a limited time you can buy the double stroller for the price of a single. That’s a $100 savings. 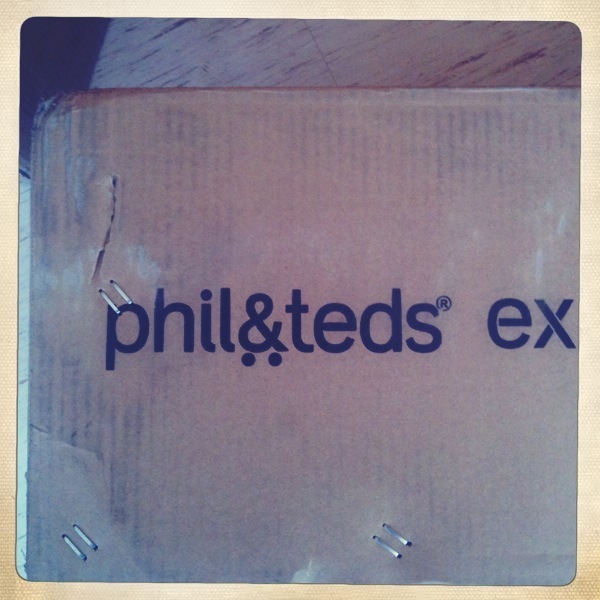 This is what I love about phil&teds. This stroller has seven modes — count them…seven. 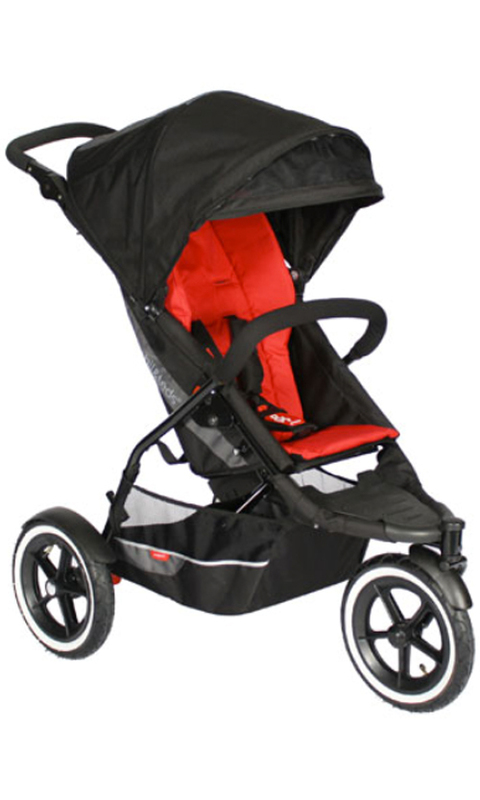 This is the perfect in-line stroller that can follow your baby from infancy to age six. Adding a child to the family? No problema. Just insert the second seat to the back or front to this explorer stroller and voila! The stroller is now a double stroller. The handlebar has nine positions making — extending from 94cm/37” to 110cm/43.3” making it suitable for parents and caregivers of all heights. To adjust the handle you press the handle adjust button on either side and move it into the desired position. The sale doesn’t come around very often — and is sanctioned by phil&ted. However the sale ends this coming Monday, Oct. 31. So contact us now if you’re interested in adding phil&ted to your family. Enter the Bloom Maternity Summer Contest: Why is This Summer Different? We know why it’s different for us –- because we’ve just started a brand new maternity retail business. But we want to know why it’s different for you. How is being pregnant or having had a baby changed your summer outlook? Click on the link below and tell us in 25 words or less and you could win a phil&teds Explorer buggy valued at $480. Contest ends June 21, 2011 June 30, 2011 and the winner will be featured here. Good luck! Now here is why I love the phil&teds explorer stroller: The phil&teds explorer has the ability to accept an infant car seat and the phil&teds doubles kit at the same time. The explorer is ultra adaptable as it can grow from a single stroller into a double tandem stroller with the addition of the doubles kit. Whether one kid or two in tow, you’ll appreciate the extra large parcel tray. The phil&teds explorer features a fantastic one hand fast fold allowing you to swiftly fold the buggy in one smooth action. You can easily adjust the 5 point harness because of our patented slide & lock technology. The seat can easily be reclined with one hand. The flip-flop friendly pedal brake can be turned on and off with just the touch of a foot. The phil&teds explorer includes an interchangeable padded seat liner for supreme comfort of your precious passenger. With the contoured, vented Seat Performance System, your little one will experience increased postural support. The explorer features a large follow-the-sun canopy with two side pockets and a flip-out visor. This is the only stroller you’ll need from a newborn to two toddlers* (yes, two!) — servicing your family in seven positions that you’ll only need. *additional doubles kit is not included in this promotion. We have a new delivery!